Understanding how satisfied your customers or clients are with your product or service is invaluable. This information can help you improve the entire customer journey, from the moment they visit your site or store, through to the aftercare they receive. However, just throwing together a customer satisfaction survey and hoping people will fill it in is not going to provide you with very many responses. You need to create a customer satisfaction survey that people will actually want to fill in. The more responses you get, the more data you receive, and the more you’ll be able to utilise that information. With that in mind, here are our top tips for creating the best customer satisfaction survey that will lead to the most responses. Before you put together a customer satisfaction survey, it’s important to consider who you are going to be sending it to. For example, hectic business owners probably aren’t going to have time to fill in a 40-minute survey about their experience. At the same time, complex or technical questions aren’t necessarily going to appeal to the general consumer. If you want to create a customer satisfaction survey that people will actually want to fill in, then it’s important to understand your audience. Look at your target market and your usual customer. Now, put yourself in their shoes and consider filling in a customer survey from their point of view. Are they going to respond better to lots of open-ended questions or a quick 1-10 scale? If you’re unsure, it may be worth creating an A/B test, so that you can see what kind of customer survey garners the most responses. What data do you want or need? Usability of website – How easy was it for your customer to find what they wanted? How easy was the payment system? Did the customer feel as though your site was well laid out? Did they feel secure handing over their payment details? The product or service itself – Were they happy with what they received? Did it meet their expectations? Is there anything that can be done to improve the product or service? Delivery – Was the delivery as quick as they’d hoped? Was the product packaged securely? Were they happy with the range of delivery options? Customer service – Was their issue resolved? Were they happy with the customer service representative? Was it easy to get in contact with customer services? Some customer satisfaction surveys opt for a range of different topics, to extract as much data as possible. Others focus on one key area, as this is the department they most want to improve. It’s up to you how you do it, just consider the kind of data you need before putting the survey together. Now that you understand your audience and what data you’re hoping to extract from your customer satisfaction survey, it’s time to consider the questions. What are you going to ask, to get the responses you need? And, how do you ensure that you create the right kind of questionnaire that customers will want to fill in? Short and sweet – Very few people want to take the time to fill in pages and pages of questions unless there is some kind of incentive to do so. Keep it short and sweet, focusing on the areas that you need the data for. Don’t overcomplicate things – The easier you make it for customers to answer the questions, the more of a response you’ll get. If you use too much jargon or make it too complicated, it’s likely people will switch off. Mix it up – Use a mixture of different survey question types to get as much data as possible, but also to keep it interesting for the respondents. Draw them in – Start off with a quick ‘Yes/No’ or sliding scale question that leads into a longer survey. If they’ve started, they’re more likely to finish! The final part of creating a customer satisfaction survey that people will want to fill in is to work out how you’re going to distribute it! The most common way to do this is to send an email out, asking for customers to complete a survey. However, this doesn’t necessarily get the most responses. Instead, look at other options instead. How about embedding a survey question into your email signature? This is particularly effective if used for your customer service team. 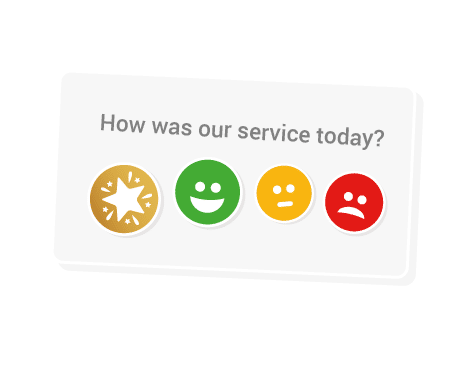 Just a simple, “How did we do today?” with a few response options ticks all of the right boxes for a quick and easy survey. This could then lead into something longer, offering your customer a chance to provide comments if required. Thinking outside of the box when it comes to distributing your customer satisfaction survey will improve response rates immensely. Everyone’s inboxes are littered with emails, newsletters and survey requests. Make sure yours stands out from the crowd, whether that’s with a quirky subject line, an incentive for filling it in, or by embedding it into your replies with the customer. They cannot miss it then! The next time you want to put together a customer satisfaction survey, stop and consider how you can make people want to fill it in. Using these top tips should certainly help improve response rates. You can also try Customer Thermometer for free if you want to put some of this advice into practice!